1. If you don’t meet the backing goal, this project will not happen. 2. If you do meet the backing goal, this project will happen. Let’s say I built an absurdist art car, and I want to add furry pink seats in time for the next Burning Man. I have a good reason to want the new seats: riding in the car without them is uncomfortable enough that people complain loudly. However, I don’t have the funds to add them myself. I have some rewards in mind: an exclusive video of the seats being installed, a ride in the car itself, and for top backers, your name painted on the passenger door. I know there are plenty of people who would back my project, so I’m ready to go. How could I screw it up? Remember: If the goal isn’t met, the project won’t happen. Easy. I could state my project in broader terms than I’m actually funding. “Absurdist Art Car at Burning Man 2013!” My project video could talk all about the car, with a quick mention of how pink fluffy seats would be nice. When potential backers read that title and watch that video, they’re left with a big question: “You already have this car. Why do you need more money?” From the project page (which is all they have to go on!) it sounds like the project will happen whether they back it or not. I had this feeling about a recent space company that went the crowdfunding route. The rewards were the usual space-company merchandise, and the project boiled down to “Help us do what we’re already doing!” My contribution wasn’t going to make a difference, so I didn’t bother. How could I fix it? Change my title to “Pink Fuzzy Seats: The Only Way To Travel” and describe the benefits (and unreasonable expense!) of the all-important seats. If the money doesn’t come through, the art car will be as uncomfortable as it was last year, so no rides for anyone! Great! How could I screw that up, then? Remember: If the goal is met, this project will happen. Messing this up is more subtle, but a lot more common. There’s an assumption underlying my whole project, something I might completely miss by (correctly) stating the goal narrowly. Take a look: can you spot it? That’s right: I need a working, drivable art car. The rewards require it, the seats are useless without it. If something happens to that car so that I can’t take it to Burning Man, then I’m on the hook to fix it. WITHOUT asking for more money. That’s the really tough part. Going back to those fluffy-seat backers with a second Kickstarter (or IndieGoGo, or anything like it) seems natural, but it’s dead wrong. By asking for new funds to make an old project possible, I’m casting doubt on my ability to complete that project at all. Why would my backers throw good money after bad? I often see this problem with films and other art projects, the kind that have lots of steps. (Writing, shooting, editing, post-production, distribution, aigh!) It’s natural to make the film the project, with backer rewards to match, but if you’re just funding the first steps you should only provide rewards from those steps. (A rough cut of the film, for example.) Don’t offer the whole film if you’re only funding part of it. In my case, I’m resolving to keep the car running and get it to Burning Man, no matter what. It’s something I would have had to do anyway, but now my backers are relying on me to get the furry pink seats on the road. Note that I’m not going to list “car breaking down” as one of the “risks” or “uncertainties” on the project page, either. If Burning Man is canceled, that’s an uncertainty. If faux pink fur melts in the Black Rock sun, that’s a risk. However, I’m pledging to do everything I can to get the car there, and it’s reasonable to expect me to deliver on that promise. Sometimes I need to work out a rough calculation to check whether my idea of something science-fictiony has any basis in reality. It doesn’t need to be super-rigorous*, but close enough to tell if my conception is way off the mark. In this case, I’ve been thinking about how it might feel to walk around a city on Mars. It’s likely to be mostly underground to help shield against radiation, but there should be as much daylight as possible to save energy. On Earth, that kind of daylighting comes from skylights, windows, and (my personal favorite) light tubes. But what about on Mars? Mars is farther from the Sun than Earth is, so it gets less light on the surface, but how much less? Is walking down a Martian street destined to feel like a gloomy overcast day? First I had to get a grip on how to measure daylight. An obvious comparison is solar radiation, measured in Watts per square meter. Depending on time of year, Mars gets between 1/3 and 1/2 as much solar radiation as Earth, because it’s about 50% farther from the Sun. That’s handy for figuring solar power output, but the human eye isn’t so linear. So it looks like daylight on Mars wouldn’t look too different from daylight on Earth. It’s orders of magnitude more light than during “golden hour” on Earth, which is plenty to get around by. It would probably feel like a partly-cloudy day, since there would be more light than even the brightest overcast day, with sharply-defined shadows. For daylighting, this probably means that Martian interiors would need twice as many Solatubes to get the same level of illumination, but we’re still talking about a fraction of the available daylight. In other words, using Earth-style lighting techniques should keep a Martian city street from feeling gloomy. *Note the use of Wikipedia sources. Kids, don’t use Wikipedia as a source if you want anyone to take you seriously. Requesting publish_stream gave me publish_actions anyway, which makes sense if the two are being treated as equals, but it also gave me a whole passel of other permissions I hadn’t asked for. As it turns out, at least one of those permissions is still necessary to do what I need: post status updates and photos to a Facebook Page. But which one? I checked the documentation again, and� well, none of them are documented at all. Not listed anywhere, not mentioned as deprecated, not anything. Huh. Some of them do sound like permissions I’d need (photo_upload and status_update, for example), but without documentation it’s just a guess. I won’t start an argument about the definition of “hard SF” or the state of scientific accuracy in fiction, but here are a few handy rules for science-fiction writers who want a quick test of real-science groundedness. I call them Joi’s Laws, because SF writer Joi Weaver put them so well. (The headlines are her laws; the rambling context is mine.) Each one is a challenge: avoid this common crutch when starting your own story. Think of them like the Bechdel Test for solid science. Space is big, and ships are slow. That�s the reality for at least another century, so embrace it. Faster-than-light travel lets your characters hop from star system to star system, but what are you really gaining? How is a rock around Epsilon Eridani inherently more interesting than a rock in the Main Belt? Even if your story is set in the far future around a far star, FTL travel is dispensable. Joss Whedon didn�t need it for Firefly, and his (solar-system-sized) universe was packed full of interesting locations. Everyone knows it: aliens in most stories are just humans with funny foreheads. Even the most unusual aliens in the most mind-bending stories turn out to have mostly human attributes, because a) it’s hard to imagine anything truly alien, and b) it’s harder to relate to truly alien aliens. So stop trying. Humans and animals have bizarre enough variations to fill a century of stories. My own corollary: No Monsters. Monster stories are great and all, but 99% of new sci-fi is already cluttered with zombies, mutant viruses, and killer robots. Next time you need something terrifying, how about the interplanetary DMV instead? This one is tough even for me. I’m obsessed with gravity, and I honestly believe we’ll be a second-rate spacefaring species until we learn to control it. Still, no one is close to controlling gravity even a little bit, so spaceships with a solid one-gee field working at all times are still pure fantasy. Besides, fifty years of astronaut hijinks teach us that weightlessness is one of the best things about space travel, and we haven’t yet explored the spectacle of low-gravity sports. The only reason your characters would actually choose to be in a one-gee field (occasionally) is due to health concerns, and a treatment for bone loss is much more believable than gravity control. Good stories can still be told if they violate Joi’s Laws. (I’m going to see the next Star Trek film just like everyone else.) They’re not a guarantee of a good story, either. If you want to tell a *new* story, though, keep these in mind to give yourself a bit of a real-science challenge. 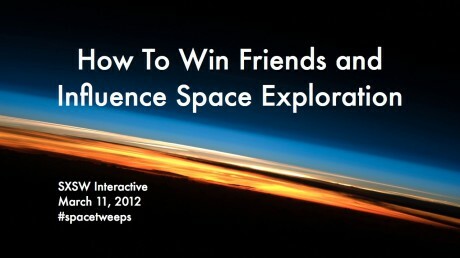 On March 11th, 2012 in Austin, TX at the SXSW Interactive conference, I had the privilege of being on a panel of space enthusiasts called “How to Win Friends and Influence Space Exploration“. You can listen to audio of the panel at the SXSW site. I might try to put the audio and slides together somewhere so you get the full effect, but that’s going to be a pain. If someone with better skills than me would like to do that, you have my blessing. Please send me the result if/when you post it so I can link it in here.